This Four Points provides free high-speed WiFi Internet in your room and in most public areas. 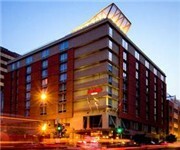 How Would You Rate Four Points by Sheraton Washington D.C. Downtown? 1. Do they purchase locally and use sustainable resources? 2. Are they eco-friendly and socially responsible? 3. Do they utilize renewable energy?